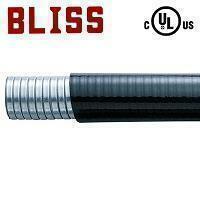 Advanced Bliss liquid-tight flexible conduit S2066 not only is UL & cUL listed but also conforms to EU RoHS Directive. It guarantees durability and safety and is environment-friendly. Flexible metal conduits can be installed in various applications, such us lighting systems, communication systems, air conditioning systems, fire alarm systems, and machinery and so on. Bliss Flexible conduits provide safe working space and construction facilities with vibration-proof and anti-interference performance. Flexible conduits can also offer better wiring and pipeline managements. Bliss Hi-Low temperature flexible metal conduit offers wide application range for demanding environment. No matter refrigirator with freezing temperature which may cause embrittlement or steel mill with very hot working environment which may cause soften, Bliss Hi-Low temperature PVC coating is durable and sustainable for long term use. Galvanized steel core, PVC jacketed. Temperature rating: dry -55~105 °C, wet 60°C, oil 70°C conformed to UL 360. Dry -50~105 °, oil 75°C conformed to CSA C22.2 No.56-13.